Originally uploaded by Adam Auden. 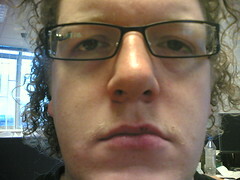 So, after a month of concentrated tacheback action this poor excuse is the best I can muster. I'll do another shot later with some colour added so you can see it in all its glory. I'm tempted to extent the experiment until the number of people who have noticed it (who didn't know I was growing it for charity) has hit double figures - I fear this could take a while. Thanks for your support. Whilst my tache is pathetic the cause isn't. Edit: You'll probably want to click through to large size to see any sort of facial hair. WARNING - this will enhance the UGLY and display my morning ashen look in its full horror. aca, I've got a bushier moustache than that!!! So what is this drive to join the great beardeds? I mean, Martin was a huge shock (especially as from the nose down he now looks *exactly* like my father!) - is it just *in* at the moment? If it is, of course, I'll lay off the shaving and see what I can come up with! At the least, I'm sure I could make a decent living at a circus! Ah, a worthy cause indeed. Though wouldn't it be better to grow said 'tashe on the bits involv.... never mind. a) nasty fungal condition you've got there. c) Couldn't you just grow a goatee instead, as you know you can do those? Far more sponsorship-worthy. d) For God's sake use a light-coloured mascara. Otherwise it'll look really, really odd. More odd. Whatever. Holy Crap Adam, how often do you shave? A couple of times a week normally. The rest of my facial hair is rather more pronounced, it's really the top lip which lets the side down. oh, nevermind the previous. Obviously i hadn't scrolled down far enough today. Silly me.